GoManitoba has been Manitoba’s go-to tool for ride matching; helping commuters to meet carpool partners, bus buddies, and cycling mentors. We have Manitobans covered for work, but what about for play? 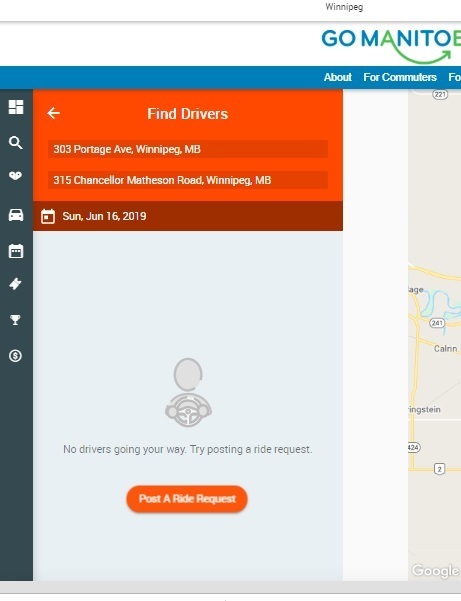 Whether you are heading to a concert, sporting event or out-of-town festival, you can now connect to share the ride with GoManitoba’s newest feature: SINGLE-TRIP MATCHING! The single-trip matching tool is used to find partners to share a ride for one-time trips. You and your carpool partners benefit by sharing the cost of gas, parking, and reducing GHG emissions. With the GoManitoba tool for Single Trip Matching, you are able to quickly find drivers and passengers for upcoming trips. Remember, this is not a taxi service! See our blog to learn more about the difference between Ridesharing and Ridehailing. With GoManitoba, you are still coordinating a carpool, only instead of this being for routine, repeating trips (like to work or school), it is for a trip on a specific date and time. With GoManitoba, you are able to pay the person driving for your share of the trip directly through the app. Once your trip is confirmed, GoManitoba will hold the trip amount. 48 hours after the trip is complete, the funds will be dispersed to the driver. We recommend in-app payments for safety, to avoid the exchange and handling of cash. To start, log in to your GoManitoba account. You will immediately notice that your home screen has changed! On the right, you’ll see two new boxes: Post A Trip if you are driving and want to offer a ride to others. Find A Driver if you are in need of a ride. You can also access these features on the left, by selecting the Vehicle icon in the list of tools. For this scenario, we’ll imagine that I am going to drive to the Winnipeg Folk Festival on Friday after work. I can create this trip now (it’s March), even though it won’t occur until July. This will give me plenty of time to find people to carpool with me. 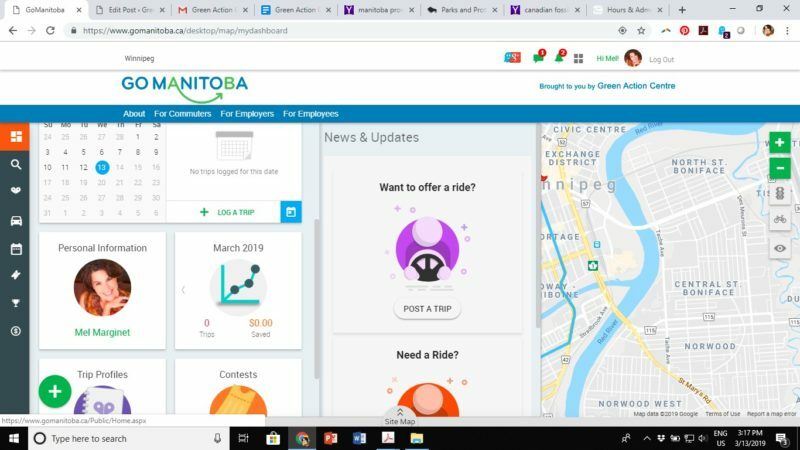 Note: Because GoManitoba is not a ridehailing service, like TappCar or a taxi, you cannot go above the max amount that the tool calculates based on the distance of your trip. This is simply a cost-recovery, not a profit maker. In the case above, I cannot charge more than $12 per seat, although I could charge less if I wanted. You must also complete details about your vehicle, including posting your licence plate details. Once my trip is posted, I simply wait to receive ride requests. When received, I have the option to accept or decline riders (similar to how AirB&B must accept your booking). Always follow the hints and tips for carpooling to ensure you have a positive experience. For this scenario, let’s imagine I am in need of a ride downtown later this month. In this example, I can see Heather is heading to a Jets game that night, and it’s right near where I need to go. I click on the trip box. At this point, I can send Heather a message to talk about this trip ahead of time (in the post on Safety, we recommend checking a driver’s reference, or meeting in a public place ahead of time). 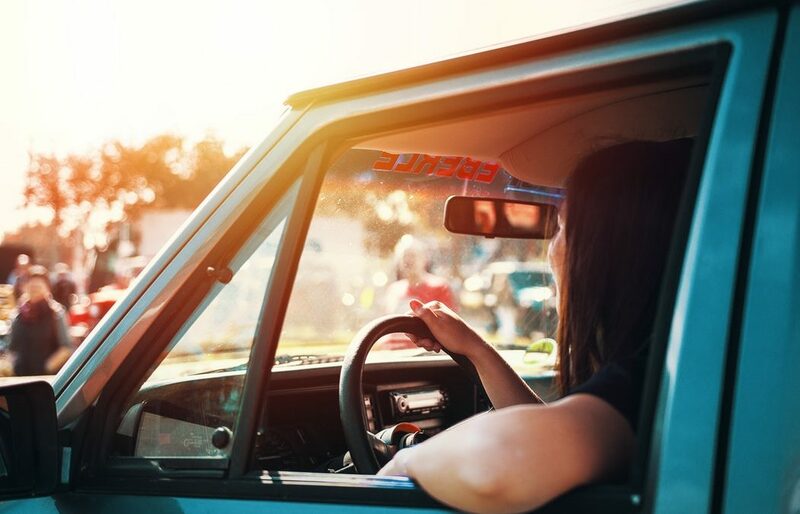 With the Single Trip Matching, you can also see the star rating of drivers and passengers to help you decide if you want to share a ride with this driver or passenger. Once you are comfortable, simply click the Book A Seat button. This will send a message to Heather, and Heather will then choose to accept you, or not, as a passenger. 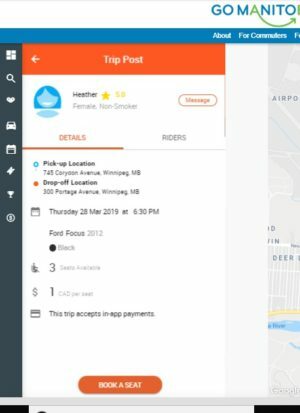 You can also input trip details for a future trip you’d like to find a carpool driver to share the ride with. For example, if I am going to run the Manitoba Marathon this June, I can input the trip details and post a ride request. Remember, GoManitoba is not a ridehailing service like Uber, TappCar or a taxi. Carpooling, or ridesharing, is all about sharing a ride with someone already making the trip. Use the tool to coordinate carpools for socials or events where alcohol will be served. Coordinate volunteer drivers with passengers from your community, like seniors. We hope that you are just as excited as we are about this new GoManitoba software update! If you have a trip coming up and would like to fill your car with new friends, go ahead and post your trip. With GoManitoba, you never have to go alone.